Lemon Kiss Apparel for Your Little Princesses - Triple Joys!!! I really love dressing up my daughters! And I am just really glad that they love dressing up too! That really saved me much time convincing them to try one dress to another whenever we go shopping! They are both much willing, thus giving me no hassle at all! Happy mommy! But, our shopping experience just got even more better when the brand Lemon Kiss was launched in year 2013. I can still remember my excitement upon seeing this clothing line for the first time! I already imagined my princesses wearing some of their collections - so cute and adorable! Aren't all these dresses pretty?! My two lovely daughters will surely love wear and flaunt all these dresses! Although, majority of their collections comprise of pretty dresses, Lemon Kiss also offers blouses, pants, skirts, overalls, jackets that target the tastes and preferences of young girls ages 4 to 12 - stylish, hip, colorful - truly embodying their energetic and playful lifestyles! 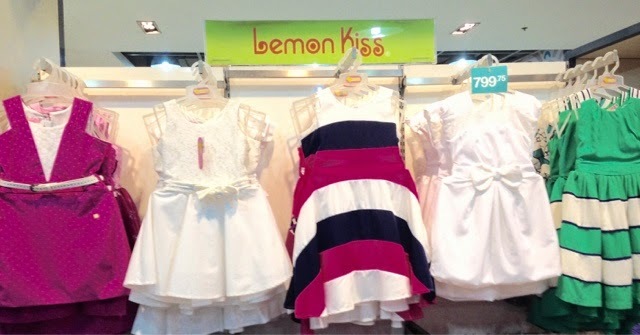 Lemon Kiss is available in SM Department Stores nationwide. You may also check their latest collection at their Facebook page here: https://www.facebook.com/lemonkissclothing.